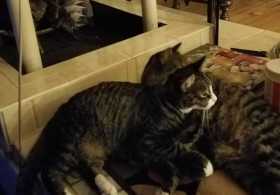 Cream cat lost in Enfield, CT. She has 4 white paws, chin and most of her nose. Brown and black stripes. She loves to rub up against your legs and be pet, but doesn’t care to be picked up. Very loving! Please contact us if u have her!